If you want to buy contact lenses online from suppliers like Vision Direct you need to fully understand your prescription in order to purchase the correct lenses. You can find your prescription on the piece of paper given to you by your optician during a check-up, on the end/side of your contact lens box or on the blister packs that contain your contact lenses. 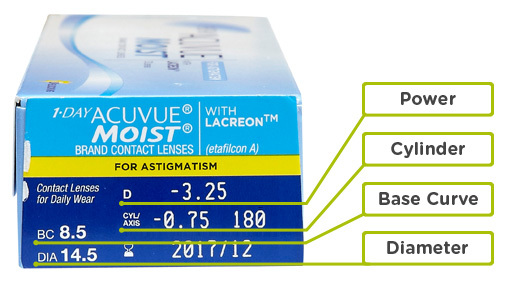 Diameter (DIA): As you’ve probably guessed it’s the diameter of the contact lens also written in millimetres like the base curve, it tells the optician which width of lens best fits your eye. Power/Sphere (PWR/SPH): This figure states whether you are long or short-sighted and how poor your vision is. If you are long-sighted your figure will begin with a + (plus sign) and if you are short-sighted it will begin with a – (minus sign), this will be followed by a number that goes up from 0 in measures of 0.25 dioptres, the higher the number the stronger the visual correction needed (this value can be displayed on the box as "PWR" or "D").